To master data science, you need to practice. This sounds easy enough, but in reality, many people have no idea how to practice. You need to master the most important techniques, and then practice those techniques in small scripts until you know them backwards and forwards. 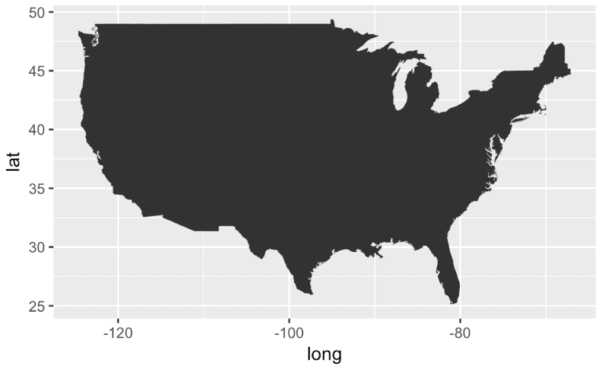 Let’s start with a simple one: create a map of the United States. Three lines of code (four, if you count the library() function). That’s it. Three lines to make a map of the US. 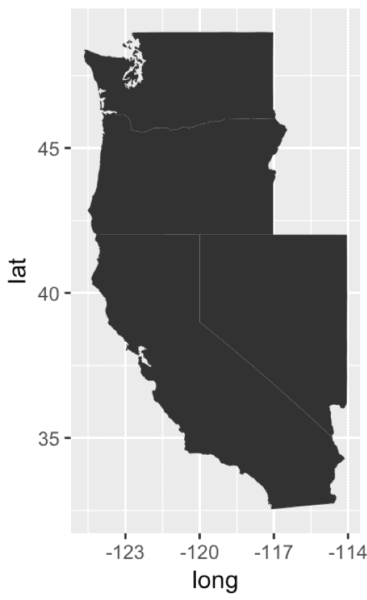 If you add an additional line, you can use filter to subset your data and map only a few states. What I want to emphasize is how easy this is if you just know how filter works and how the pipe operator (%>%) works. I want to point out again that all of these maps were created with very simple variations on our original 3 line script. It really doesn’t take that much to achieve competence in creating basic maps like this. You might be asking: why bother practicing these? They’re not terribly useful. You need to understand that large projects are built from dozens of small snippets of code like these. Moreover, these little snippets of code are made up of a small set of functions that you can break down and learn one command at a time. So the path to mastery involves first mastering syntax of small individual commands and functions. After you’ve memorized the syntax of individual functions and commands, little scripts like this give you an opportunity to put those commands together into something a little more complex. Later, these little scripts can be put together with other code snippets to perform more complicated analyses. If you can practice (and master) enough small scripts like this, it becomes dramatically easier to execute larger projects quickly and confidently. If you want to achieve real fluency, you need to practice small before you practice big. So find little scripts like this, break them down, and drill them until you can type them without hesitation. You’ll thank me later. Count up the commands and arguments that we used in the little scripts above. For the sake of simplicity, don’t count the data features that you might need (like the “region” column, etc), just count the number of functions, commands, and arguments that you need to know. How many? If you really, really pushed yourself, how long would it take to memorize those commands? If that’s not the issue, then there’s something else going on. 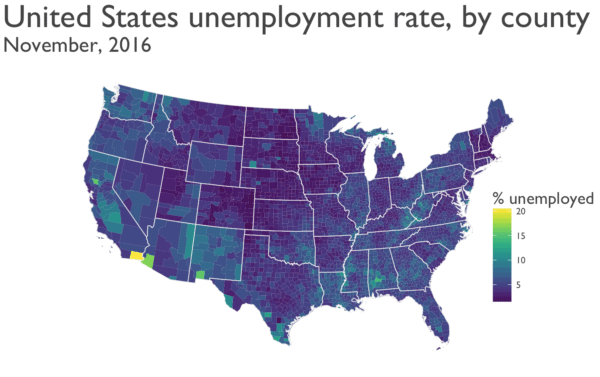 When I run the code for second example on (# MAP USA (STATES)), there are no borders showing – is the code correct for the maps showing, or some line missing that would add the borders? The borders should show automatically … it’s not clear why they are not in your case. 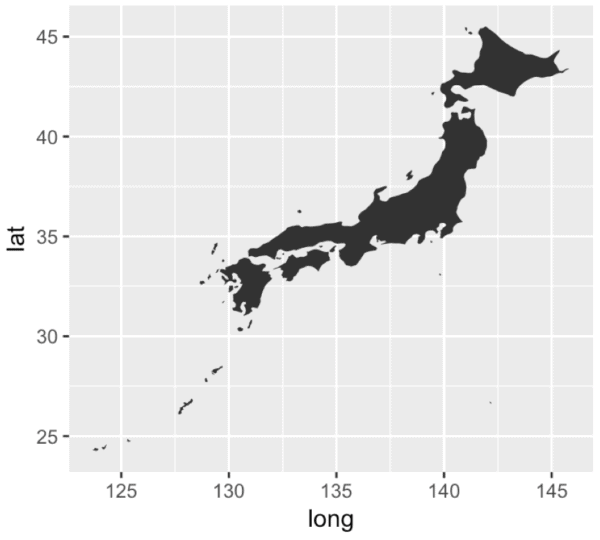 The color bit in geom_polygon() did the trick. Really nice post. Thanks. Excellent … good to hear that it worked. Though since updating R-3.2.0 to R-3.4.1 I get this error message. It was working fine before updating R. Any ideas how to get around this issue? I can’t replicate your exact issue, but recently I’ve had similar problems using some of the functions from the purrr package, like purrr::map(). At a quick glance, this appears to be a naming conflict between functions from different packages. At what point do you encounter the error? 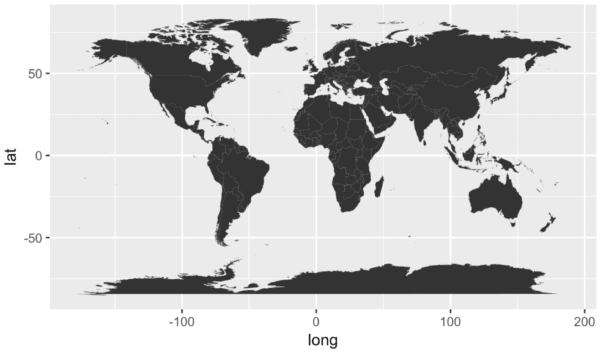 When you run map_data(“world”) ? Or a different point in the code?